Are your kids sick of coloring books and crayons? I have an idea for you! Art is really important to me. I love drawing, and I want to provide an environment for my little artists when they feel like creating. However, sometimes they get tired of the scrap papers and coloring books that are always available. And during some of those times when I don’t feel like getting out messy media. So I keep the crayons and change the canvas, so to speak. One fun way to do this is to pull a big sheet from our roll of paper on the easel and use washi tape to attach it to our coffee table. 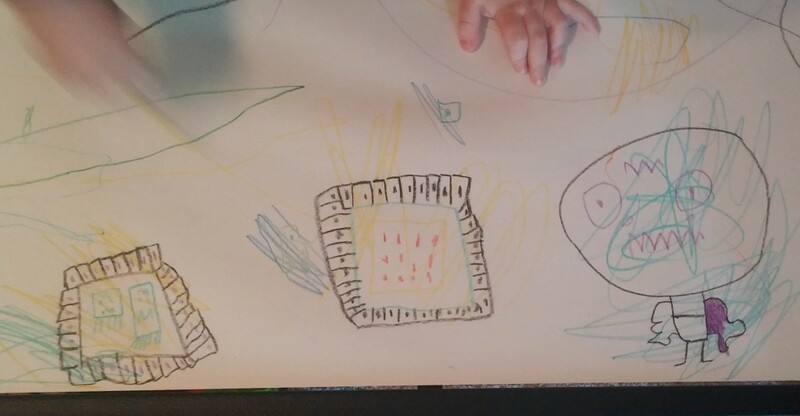 Cupcakes drew the Ender Dragon as well as some Nether Portals (from Minecraft) and there are Ghasts coming through one of them, haha. The scribbles you see are where TR wanted to color in Cupcakes’ pictures. He always does this. Poor Cupcakes. It was fun anyway! Changing things up, even in this small way, makes your coloring activity different and fun! Another thing we did to add to the fun was something I prepped during nap time. I say “prepped”, but it was so easy that maybe that’s not the right word. I took a few of my stamps and just stamped all over their big paper so they could color those in when they woke up. That was fun too! When your kids are finished, be sure to put their work on display! This makes them feel proud and confident in their artistic abilities!